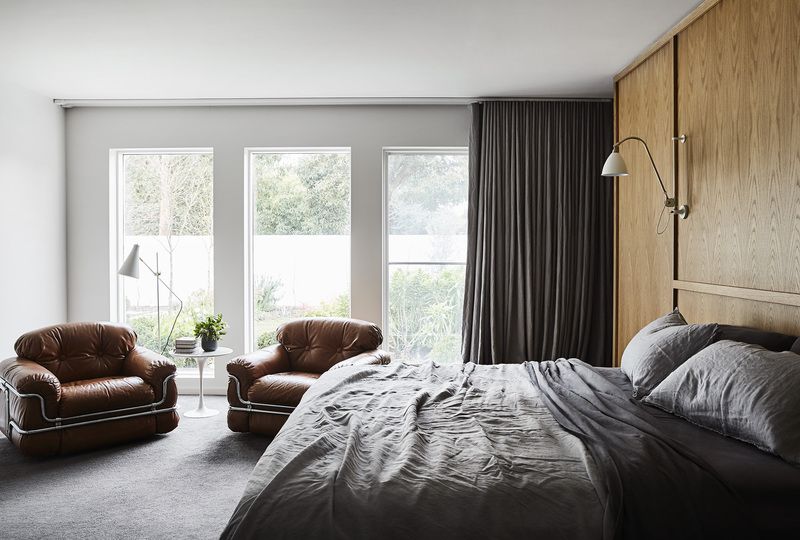 Embracing the tenets of modernism to create a contemporary home, Beatrix Rowe has transformed Caulfield house, writes inside co-editor Gillian Serisier. 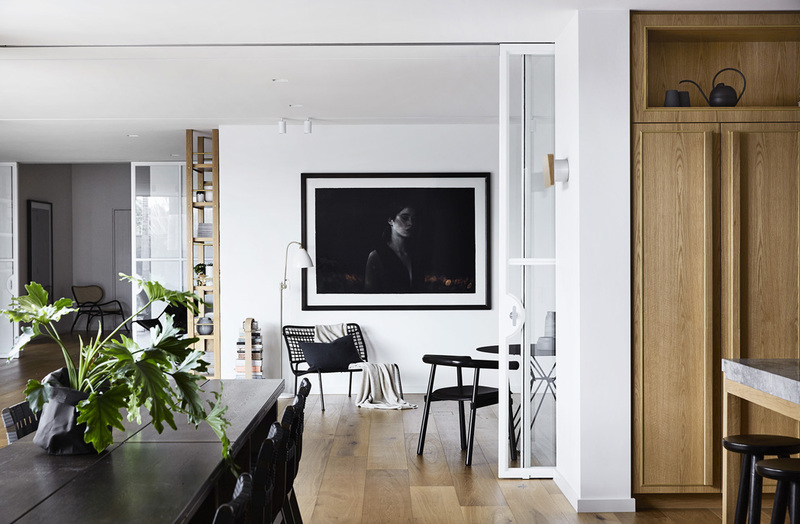 Starting with the beautiful bones of a 1960s home, Beatrix Rowe Interior Design’s (BRID) construct is very much in keeping with the tenets of modernist design – light-filled, calm, without clutter, where materiality is celebrated and art is very particular to the occupants. As Rowe says: “The house had a beautiful sense of scale to it, in that ’60s Palm Springs kind of way. The architecture was pretty simple and that drove our thought process.” Structurally, the shape of the home has been minimally altered to include the addition of two pods via architect Taylor Reynolds. Conversely, every aspect of the interior has been replanned and redesigned with internal apertures made larger. “The inside didn’t speak to the outside, so we stripped it back to its structure and replanned it to suit the clients. In doing so we considered how the light comes into the house and created a change of orientation,” says Rowe. To this end, the design has opened the space further to allow light to fill the internal volumes and make the most of the ceiling height. A series of ceiling-hung sliding windows with white frames and large semicircular handles create noise-controlled zones without truncating visual flow or light penetration. Similarly, the external 78 windows have been refreshed with fine frames, in white, as are all walls both inside and out. Providing contrast and nuance is the use of black, stone, timber and textured tiles. Again, in keeping with modernist tenets the materiality is clearly defined. The floor, for example, is a short plank American oak (Architect Collection, Royal Oak Floors) that deliberately allows contrasts. Cabinetry, in a combination of solid and veneered American oak, is crown cut, polished and book matched with meticulous attention to detail. It is also prolific, with bedrooms, kitchen and lounges all benefiting from the timber warmth. 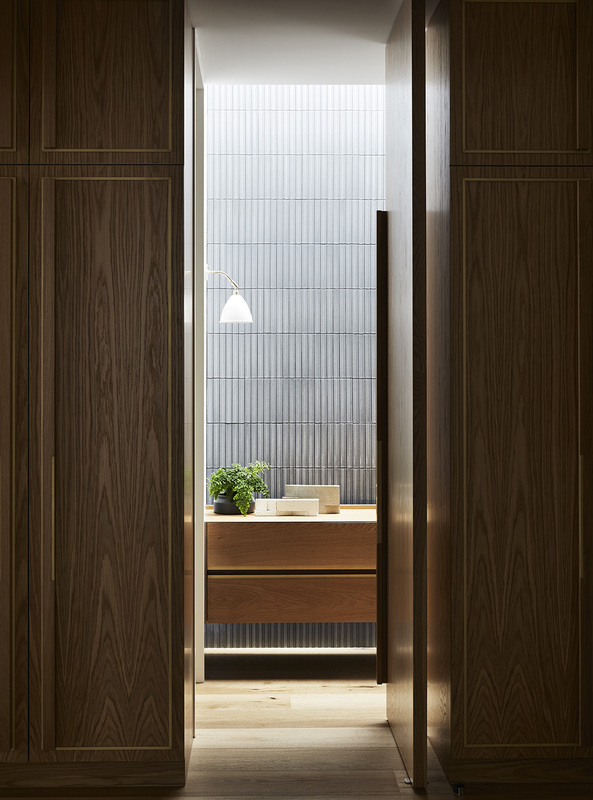 “Vertical and horizontal planes of material give a ’60s feeling and the joinery is informed by era to be furniture like – enduring and solid – to age with time,” says Rowe. Stone is similarly of great importance, with large areas of granite (Winter Haze, CDK Stone) used in the kitchen and bathrooms. Rather than the terrazzo like pattern of most granites, Rowe’s choice has a full veined figuration of tonal shifts and it delivers quite a punch. 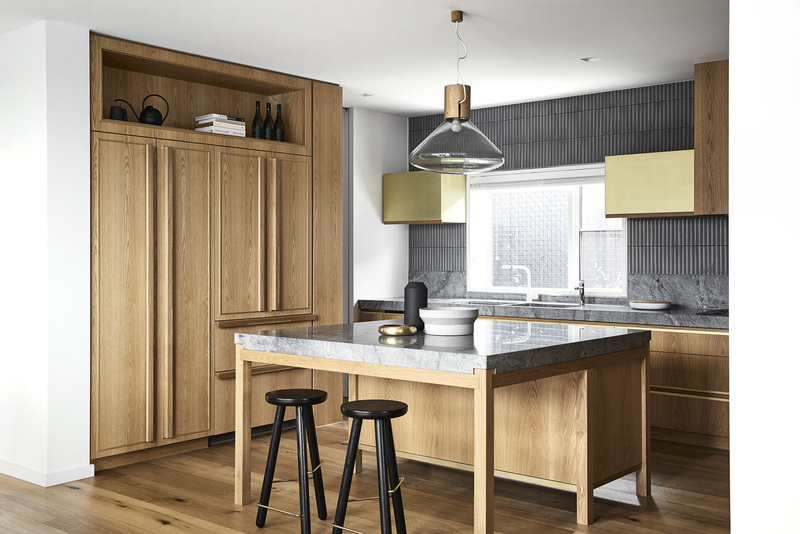 The kitchen is centred by a magnificent piece of joinery, where the detail of the leg joint is inset to the granite slab. The benchtop and splashback use the same granite, but paired with fine vertically aid ceramic tiles. The combined textural energy of timber, tile and stone is remarkably harmonious, nuanced and calm, while simultaneously rich. The result is exceptional. 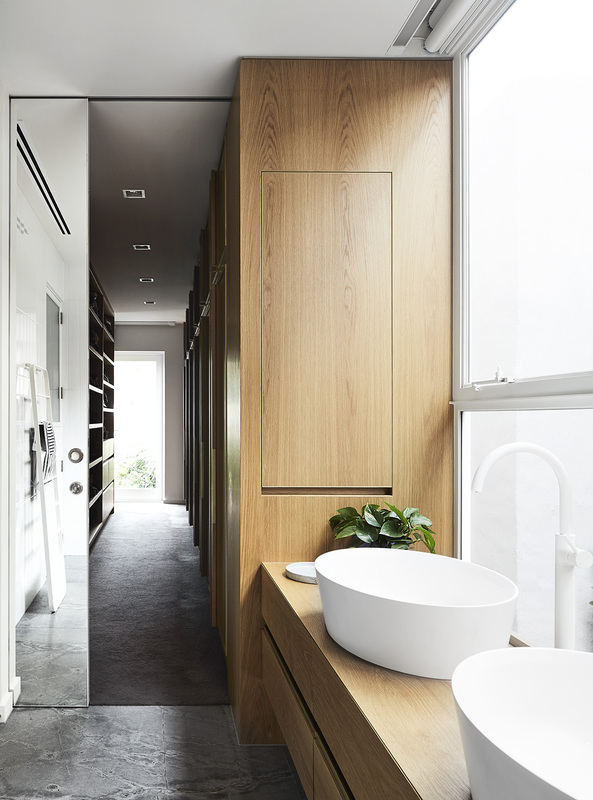 The bathrooms share this pairing of opposing energies, being calm, monumental and featuring contrasted layers within the minimal material shifts. 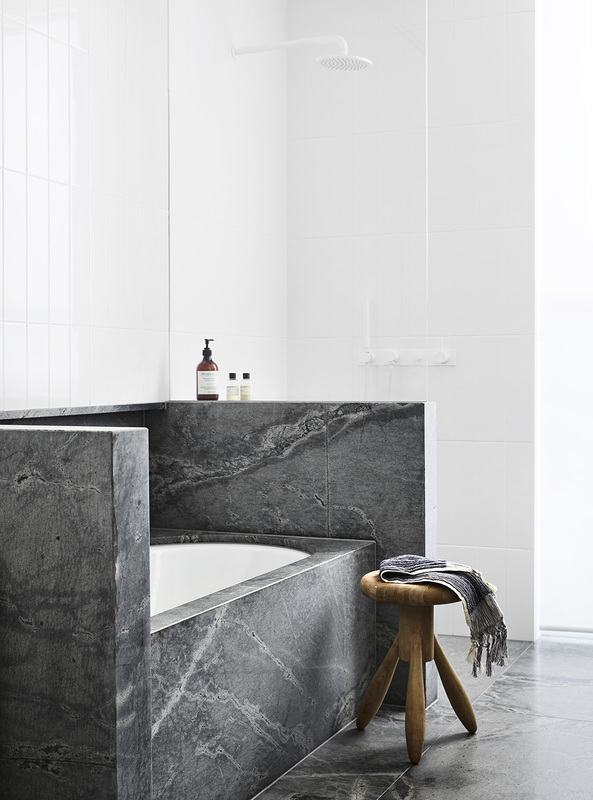 Here, large format white tiles (Alaska Gloss, Classic Ceramics) and matt white tapware (Astra Walker, Mary Noall) provide an almost invisible backdrop to the large swathes of stone. The master bath in particular makes this point with a high casing and stepped-in surround of granite extending to a floor of the same. The white tapware is a particularly interesting choice and rarely seen. Here it speaks to the house’s era and minimal aesthetic, but, more importantly, the high-quality finish reinforces its contemporaneity. In the powder room, for example, the pairing of the curving white faucet with a Bestlite BL5 wall light (CULT) creates an elegant symmetry of form. Black plays a vital role, with a Fifty by Ligne Roset chair in the portico hinting to the interior. 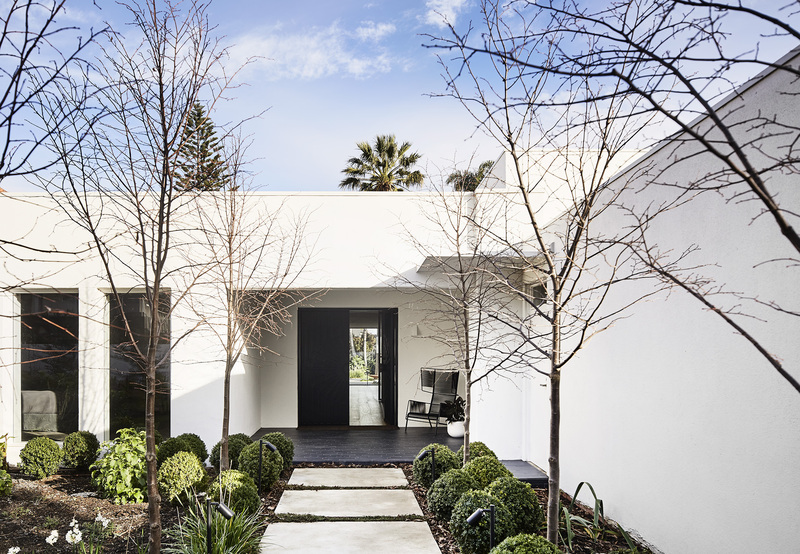 The front door too plays a role, with its sunray form given fresh intensity with a coat of black. These elements have only been possible with the opening of the interior that has allowed light to infuse the hall and offer a contrast. It has also allowed the deep shades of the Bill Henson photography to be both tonally introduced and not plunged into gloom. Black has been used sculpturally too, with chairs in particular reading as variety of form within the volume. The Frog chair by Piero Lissoni (Living Divani, Space Furniture) and Patricia Urquiola’s Altay dining chairs (Coedition, Hub Furniture) provide the stand-alone elements, while the custom ding table and Webb chairs (Gordon Mather Industries, Grazia and Co) provide a solid element. Television and film is an important work need and the lounges have been created for incredible levels of comfort. Moreover, with the sliding glass walls permitting light to flow from one side of the house to another, the lounge is in fact an internal room with layered curtains for precise light control. The upper layer of linen is repeated in the gorgeously floppy lounge (Nebula Nine sofa by Diesel with Moroso Hub Furniture) with the addition of rust tones, cream and a reindeer hide for textual qualities. The family lounge is similarly comfortable, but with more formal lines, despite the robust purple of Patricia Urquiola’s Tufty-Time (B&B Italia, Space Furniture) For this room, the era play is subtle, with the use of contemporary design elements that have a ’60s feel rather than re-editioned pieces. Instead, a Naoto Fukasawa table (B&B Italia, Space Furniture) and a Celestial floor lamp (Santa & Cole, Ajar) provide form, while a geometric rug from Iran (Azari Collection, Behruz Studio) contains the whole. A black lattice conceals the television within oak cabinetry and ties both material warmth and black line back to the whole. There is a considered quality to the project that is more than attention to details. Instead, there is attention to every aspect, with Rowe taking a meta-view of macro and micro elements towards a cohesive entirety. The result, in this case, is a home that speaks to its era but is in no way bogged down by conventions or clichés. Rather, the philosophies of modernism are realised within the technology and material qualities of today. Moreover, as it is a Beatrix Rowe interior, it is also extremely beautiful.